United Yacht Sales New Jersey would love to guide you through a personal showing of this 70' Hatteras 70 Ft Motoryacht 1983. 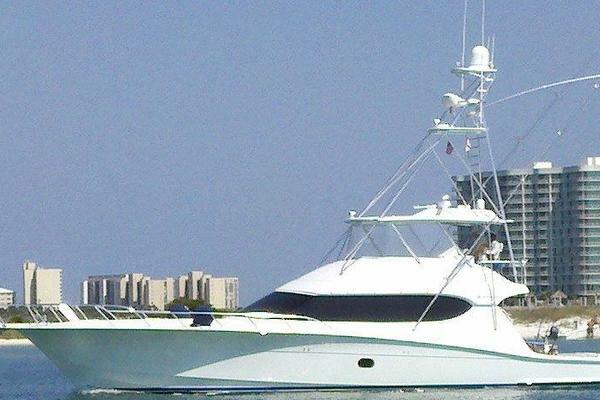 This yacht for sale is located in Charleston, South Carolina, South Carolina and priced at $320,000. For a showing please contact us by filling out the form on this page and we will get back to you shortly! Entering amidships into the wheelhouse from the custom tide ride electric staircase you’ll be moving aft starboard and to port you’ll be viewing the (new) galley complete with S/S appliances, convection ovens, conduction cook top and the lovely counter spaces. Moving aft you’ll be entering the newly decorated and massive dinning/salon areas. Aft is the open bar areas complete with a circular table and chairs to starboard and a complete wet bar to port. Over head is a large flat panel Sat/TV which is able to face so that all aboard may view, or face aft in the bar area thus providing a more private viewing.Forward of the bar area and to port is the circular stairway leading to the staterooms. There is also an flush floor mounted elevator in the main salon which may be used for handicap access to the two levels, or for heavy luggage. At the foot of the stairs and moving aft is the Master Stateroom. The Master has a centerline queen with a copious amount vanity, hanging lockers, and drawer space. The ships stereo and Sat/TV is here just as it is in every stateroom. There is an ensuite head, shower, yes and even a tub.Moving forward in the companionway from the master and to port is the guest washer/dryer. At the end of the companionway are the guest staterooms. They are mirror images of each other. Both have twin beds, ensuite heads and showers and of course, Sat/TV.Let’s get back up to the main level bar area and open the door that leads to the aft cockpit where while cruising a couple can sit and simply enjoy the view. From the cockpit area there is a custom S/S stair the leads to the upper deck. This nearly 1,000 sq. foot area, which one half open to the elements and the other is closed. The areas may be filled with chairs or mingle with all aboard and enjoy the view.From the Wheelhouse on the main deck and down the stairs is the crew quarters, kitchenette, laundry and engine and mechanical room.Exit either Wheelhouse sliding door, go forward and you are on the foredeck. There is deck space you’ll want to explore where there is upholstered sitting galore. Recent Survey is available upon request to Broker.